I have been using registered version of endless slideshow screensaver for years flawlessly until very recently. No changes upgrades or anything to system. I now get a out of system resources error very shortly after running. I checked the resources and have plenty. just cant figure it out. Some help would be greatly appreciated. 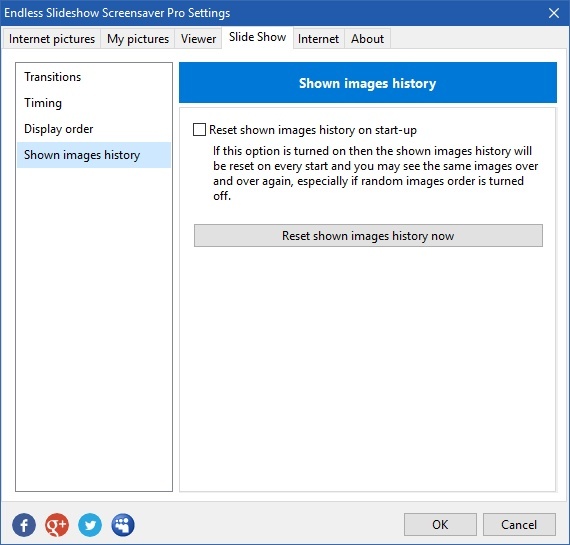 Then open the screensaver settings, select the Slide show tab, Shown images history section and click the Reset shown images history now button. That should help. Hello and thank you for your response. I am using the newest version 1.10. Resetting the image history has prolonged the issue but it still occurs. I have screen prints of the error if I could upload them somehow. Since the problem started I have uninstalled then cleaned registry and file traces of setup files, rebooted then checked again for traces, then deleted temp directory files, cleaned Prefetch then emptied the trash. Continuing I then rebooted again then reinstalled. The print screen shots of the error are from this last point. If you can help with this issue I would be grateful as I have always loved Endless Slideshow Screen Saver Pro. OK, can you send me the screens to support@exisoftware.com? Okay and thanks. I have sent the screen captures in a reply to your email. Yeah, great! I got the screens. Now, can you end me the "bugreport.txt" file? It has more information about the error. It's located in the same folder where the executable file of the screensaver was installed (one in Program Files, another one in Windows folder). Sorry, the actual file name is "esss-bugreport.txt"
Found it. I will send in email... Thanks again. Hello Maxim. Were you able to find anything that would solve my issue, in the error file?